NWTFC prez John & Marie Turner were spending a couple months in Apache Junction, Arizona in their Trek, when Ed & Jeanette Block came through for a week at Sunrise RV Resort — following Januarys Trek rally at Quartzsite and enjoying the sunshine of Yuma. It so happened that Rodger & treasurer Colleen Wright had done the same, found a campsite at Lost Dutchman State Park, and had visited Turners as well! It was our luck that John enjoys hitting the backcountry roads with his Bronco and had an off-road adventure in mind. Two couples they know from Roadhaven RV Resort were eager to go too. The Wrights joined the group in Blocks Jeep Renegade. With comfortable temps and a few fluffy clouds overhead, the plan was to head out, bright and early, on Hwy 177 to do the Battle Axe Road to Walnut Canyon. John would lead us to an artesian well and some old mining prospects — skirting the edge of Copper Butte. 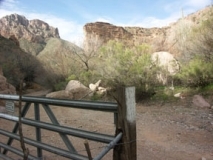 If the Gila River was dry — or could be safely forded — we hoped to continue to the Cochran coke ovens and a trickier road to the remains of the old mining camp & RR stop of the early 1900s. Trail erosion and tight brush conditions early-on, gave us our first Arizona pin-striping but we accepted that as a Jeep Thing  hopefully something that could be buffed out. We backed out of some wash areas and found good footing to continue. The drive through the saguaros, ocotillo, cholla & prickly pear was generally easy, but we were gaining or losing 2,000 feet or so in elevation so there was plenty of shifting and steering to keep the wheels out of ruts and on the high rocks. The driver didnt get to appreciate the scenery, distant buttes and occasional flower as much as his passenger/s, but there were a couple fine places, like the well in Walnut Canyon, to pull over to take it all in  take a knife to the cactus spines in our walking shoes — and discuss what wed be doing next. A cattle gate and grate gave reason to expect cattle, but the only creature we spotted was a lizard zipping across the trail. At midday we didnt spot many birds either. We came across an abandoned mine where the views were awesome, but the wind was too strong to enjoy a good picnic, so we chose a wide protected spot nearby, while John puzzled over his Broncos spark plug or carburetor problem. Some Jeep Rubicons passed us by, as did a few oversized quad runners, so we remained hopeful that the road ahead was doable. As we neared the Gila River though, we found the way impassible for anything but a rock-climbing vehicle . . . cutting us off from the coke oven road. Beyond that section, the guys were surprised to find the muddy river flowing strongly, so the Cochran ghost town was also inaccessible this time. We saw the Rubicons again, so assumed only the group with quad runners may have tried the crossing. We headed back through that mountainous desert terrain with still different road conditions and vistas of the Superstition Wilderness. We all stopped for a Mexican meal before calling it a day  a very satisfying one with good friends! Thanks, John!